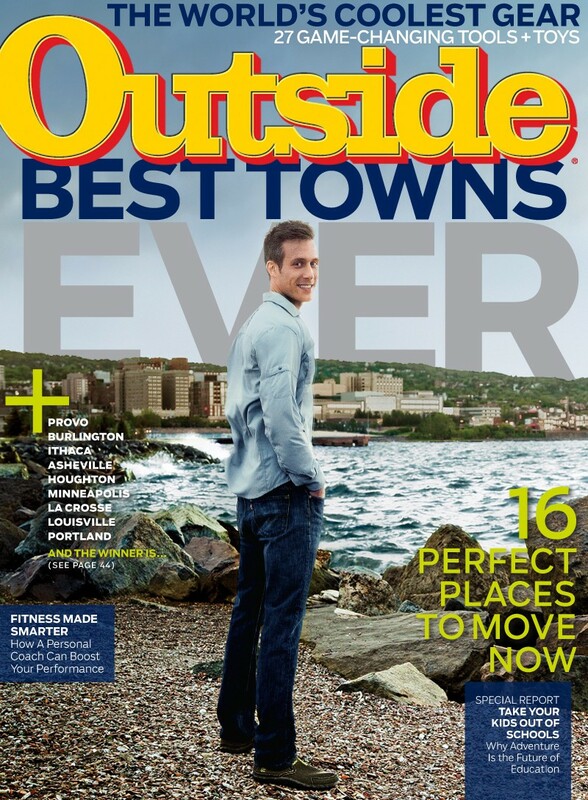 The September 2014 cover of 'Outside' Magazine teases its "Best Towns Ever" contest. Burlington and Montpelier both made the list. Let's just get this out of the way: Duluth, Minn., topped the list in Outside Magazine's annual March Madness-style voting tournament for "Best Towns Ever." But two small Vermont cities — Burlington and Montpelier — also ranked pretty high on the list, which included 64 towns at the start of voting. Burlington came in 7th, and Montpelier was 16th. And of course, Vermont and its towns and cities are often pretty well-represented on lists of accolades. The criteria for making it into Outside's best-towns pool? "Access to adventure, healthy eating options, bike lanes and green spaces," according to the editors. And aside from user-submitted votes, the finalists were also ranked according to a formula the magazine's editors refer to as the "O-score," which used data such as the "number of outfitters, miles of trails, and number of bike shops—plus considerations like unemployment rates, median incomes, and, yes, an editors’-choice variable" to rank each town's livability on a scale of 1 to 100. Burlington scored 83 and Montpelier got 74, in case you were curious. After all that the winner was, well, Duluth. I've never been there, but it must be great, since 66,758 voters turned up at their computer screens to share how awesome it was in the final round of voting. "Our winner absolutely crushed every voting round," write the Outside editors. Groovy. But we're sure that while those guys are busy patting themselves on the back, Burlingtonians will be soaking up the sun on Lake Champlain and Montpelierians (Montpelierites?) will be making the most of nearby mountain trails. But, you know, thanks for the props, Outside!